DEERFIELD BEACH, FL — August 2016 — Inovaxe today announced plans to exhibit in Booth #321 at SMTA International, scheduled to take place September 27-28, 2016 at the Donald Stephens Convention Center in Rosemont, IL. For the first time, Inovaxe will display its new low-cost SR Series Smart Rack and InoBin Smart Mechanical Cart. The SR series Smart Rack is intended for customers whose main challenge is finding parts quickly and do not need all of the features of the InoAuto Smart carts. The design is based on Inovaxe’s cost-effective InoKit platform. 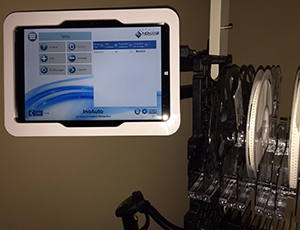 The units start as low as $4890 for an 80 location 7", 8mm smart reel system, which includes the controller and Inovaxe’s InoAuto Locator software to locate and return parts, and then just add more trays for only $877 each. 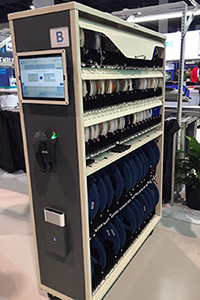 The SR series trays are available to store 7" and 13" reels, and are fully upgradeable to InoAuto Smart units with all of the kit management and connectivity features. 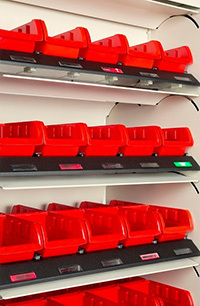 The InoBin Smart Mechanical Cart stores 70 Smart bins, 10 per shelf on individual slides, in the InoAuto half cart. The InoBin detects when the bin is pulled out and is pushed back into its position. The InoBin Locator Software provides its users with many features for managing transactions in and out of the bins. When the parts are pulled out, the part numbers that are in the bin will appear on the touchscreen, the light pipe illuminates and identifies the proper bin location to the operator. The InoBin also is available in the new low cost SR series Smart Rack. Inovaxe’s NPI Award winning InoAuto Smart Mixed full size cart also will be on display. This unit stores a combination of 480 7" and 160 13", 8mm reels. Also, it includes an intelligent tray for bulk storage of PCBs or JEDEC trays, and an option for smart tube storage. The slots can be configured for 12mm and 16mm reel widths.